It is our belief, that food is a necessary accompaniment to great beer… and that food should be delicious! Our house made beer chili served in a freshly baked sourdough bread bowl and topped with shredded cheese, diced onions and sour cream. Served in a freshly baked sourdough bread bowl with sourdough crostini. Served with our homemade queso sauce. Hand-shredded and formed tater tots. Served with queso sauce and pickled jalapeños. Our own hand-shredded tots topped with mixed cheese, BACON and chives. Served with sour cream. Panko breaded house-marinated artichoke hearts. Served with garlic artichoke cream sauce. 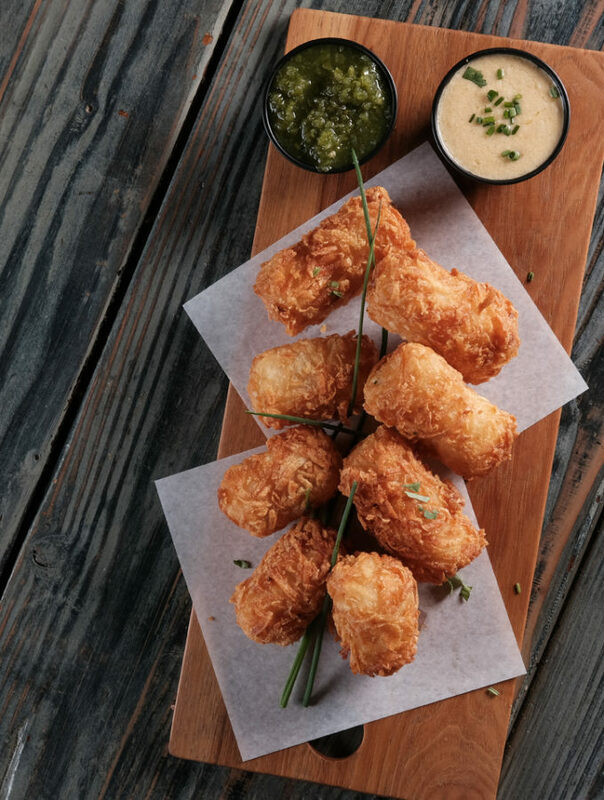 Crispy and creamy, just like you’d expect… but better. Ditalini pasta, Jack and Cheddar queso and BACON! BACON cheddar mashed potatoes fried in a crispy egg roll wrapper. Served with a side of sour cream. Served in a freshly baked sourdough bread bowl with corn tortilla chips. Lightly fried beer-braised wings with a dusting of Louisiana spice.